The band was formed in Cambridge, England by Steven Adams, Jay Williams, Micky Roman and Gavin Johnson in 2001, following the break-up of Adams and Williams’ indie rock band Hofman. Their musical style has variously been referred to as alt. country, country rock, new wave, and indie-rock (the latter term being favoured by the band). 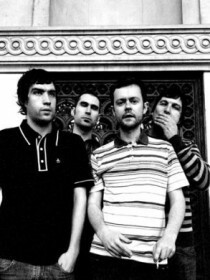 Originally formed “for fun” and to play irregular shows at their local pub and record one album, the band were encouraged by friends to perform support slots in London. After appearing on a bill with The Walkmen, they were signed to indie label Snowstorm, for which they recorded one mini album ‘The King Will Build A Disco’ and their first full length album ‘Cold Water Songs’, both of which featured guest appearances from Samantha Parton fromThe Be Good Tanyas, Martin Green from Lau, Inge Thomson from Harem Scarem and Owen Turner from Magoo. Both records received an excellent critical response, as well bringing the group to the attention of John Peel, who had them record two sessions. The Broken Family Band were invited in 2006 to make a short film for Channel 4 for their "4Play" strand; they did this and it was duly shown in the United Kingdom of UK. The programme was produced by High Horse Films. The group originally featured a selection of guests, both on recordings and in live performance, although as their sound become less rooted in acoustic traditions, they began to solely appear as a four-piece, occasionally augmented by Timothy Victor. In 2009 the band moved to Cooking Vinyl and released the album Please And Thank You. The band announced on their 2009 tour that this album will be their last, and that their final date in Cambridge will be their last gig.